James A. 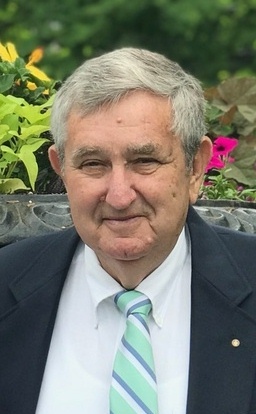 "Jimmy" Roberson, age 77 of Hudson, KY died Tuesday, August 14, 2018 at Twin Lakes Regional Medical Center. He was born in Custer, KY on April 5, 1941, the son of the late Raymond Arthur and Juanita Pile Roberson. Jimmy was a member of Hudson Community Church, Gideons, Heavenly Echos and performed for many years with the Hudson Gospel Five. He enjoyed playing bass, singing, playing golf and watching westerns. He was a very loving and devoted husband, father, grandfather, brother and friend. In addition to his parents, he was preceded in death by his stepmother Margaret Roberson and sister Beth Morris. Funeral services will be held at Hudson Community Church on Friday, August 17, 2018 at 11 AM with Rev. Jimmy Tucker officiating. Burial will be in the Hudson Cemetery. Visitation will be held at the church on Thursday, 3:30 - 8 PM and Friday after 8 AM under the direction of Trent-Dowell Funeral Home. Expressions of sympathy are suggested to Hudson Cemetery.